Villainy seamlessly emerges out of this moment of gaiety, a thematic juxtaposition that becomes a hallmark of this production as the play's comic and dramatic elements feed into each other in a tight weave. Benedick (Brad Sytsma, on his knees) listens to Leonato (Scott Lange) describe Beatrice's love for him in a joke prompted by Don Pedro (Eric Orive, back left) and Claudio (John Scritchfield) in Pigeon Creek Shakespeare Company's production of William Shakespeare's Much Ado About Nothing at the Rose in Michigan's Blue Lake Fine Arts Camp. Photo by Eric Minton. 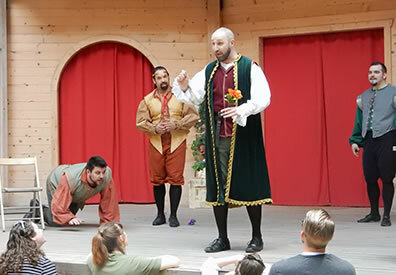 Seeing a William Shakespeare play in a re-creation of an Elizabethan outdoor theater, such as the Rose at Blue Lake Fine Arts Camp near Muskegon, Michigan, inspires insights that can significantly expand your Shakespearean understanding. To wit, as Pigeon Creek Shakespeare Company's production of Much Ado About Nothing is about to start, it occurs to me that the area for the groundlings resembles a mosh pit at rock concerts. Just another example that most innovations in the world of theater have already been done, and what's old is the new new. This production gives us two parallel experiences: the play that features several keen performances, and the playhouse that bestows a soul-embracing sense of belonging on those who merely enter its environs. Combine the two and we get a Much Ado About Nothing that's like nothing else I've felt. Blue Lake Fine Arts Camp was founded in 1966 by Fritz Stansell on a site that had been Camp Hardy, a Chicago, Illinois, camp for boys since 1910, covering 1,600 woodland acres in the Manistee National Forest just north of Muskogee, Michigan. Some 5,000 artists from fifth to 12th grade come here each summer for 12-day camps in music, dance, and theater. The premises include typical wilderness camp cabins in enclaves called Camp Sousa, Camp Bernstein, and Camp Gershwin along with a social center, dining hall, and a huge music shell. On a meadow down a dirt track from Camp Gershwin sits the Rose, a half-timber building you'd expect to see on the bank of the Thames in London rather than the middle of a Michigan forest. Built in 2010 for the Blue Lakes Theater Department's students, the Rose is a downsized sampler of several Elizabethan theaters, with a wood interior and a stage with two pillars and two levels, not counting "the heavens" at the top, which is not used. It does not have workable space under the stage, either. The playing levels have three curtained entrances each. The two-level gallery can seat about 600 with another 150 groundlings in the mosh pit. True to Elizabethan theater principles, the Rose has no electricity or plumbing (rest rooms are in the indoor theater complex across the meadow). True to 21st century building codes, it does have a fire sprinkler system. Sitting in the cozy environs would be a great way to while away a couple hours just daydreaming. Imagine seeing a play here. Which is exactly why, almost a year after Katherine Mayberry, an instructor in the camp's Shakespeare program, gave my wife, Sarah, and me a private tour of the building, we came back to see a play produced by Mayberry's professional theater troupe, Pigeon Creek Shakespeare Company. Based in Grand Haven about 30 miles south of the Rose, Pigeon Creek Shakespeare tours Michigan and sometimes beyond, usually playing in "nontraditional theatrical spaces" and using Shakespeare's original staging practices: minimal sets, some props but detailed costuming (not exclusively Elizabethan or historical), doubling roles, liberal cross-gender casting, universal lighting for audience and cast, and, because of that, actors directly addressing and interacting with the audience. 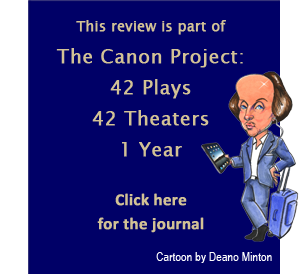 The original production practices standard also means gleaning the play's action and its character's behaviors directly from the text, though Pigeon Creek does hire directors for its productions. Twice a year, the company stages a benefit production at the Rose for Blue Lake Public Radio, located on the arts camp. Because of the production's one-show-only nature, Pigeon Creek remounts a play from the previous season, reuniting as much of the cast as it can and adapting the production to the Rose's stage—which is the standard MO for the company, anyway. This, though, is a space replicating the space for which Shakespeare wrote Much Ado About Nothing. This fact manifests in some of the blocking for this production. For example, the outer edge of the stage, with the two pillars serving as a demarcation, becomes a path for actors to enter and be seen approaching by other characters before the newcomers arrive in the scene. Antonio in act V, scene 1, says "Here comes the prince and Claudio hastily" after the stage direction for Don Pedro and Claudio to enter, and Eric Orive and John Scritchfield, respectively, do so by coming down the edge of the stage around a pillar and then toward stage center. Later in the scene, Don Pedro's line "See, see, here comes the man we went to seek" comes two lines after Benedick enters in the Quarto edition of the play; he needs time to come on and for the brothers Leonato and Antonio to exeunt before Don Pedro and Claudio notice him (plus, overlapping Benedick's entrance with the departure of Antonio and Leonato is dramatically significant). Director Alisha Huber embraces many textual advantages the space offers her. In his gulling scene, Benedick (Brad Sytsma) hides among the groundlings (though there's only a few people down there—the galleries are the preferred seating for this NPR audience). Borachio (Josh Fremer) comes through one of the entrance's curtains but stops to listen to Don Pedro and Claudio, moseying toward another exit, formulate the wooing-Hero-by-proxy-at-the-masque plan. At that masque, Claudio leads the dancers and then the audience into singing along to "Hey nonny nonny." As the rest of the party moves off singing with the audience, Claudio remains alone on stage, except for Don John (Kat Hermes) and Borachio, who proceed to bate Claudio into jealousy. Villainy seamlessly emerges out of this moment of gaiety, a thematic juxtaposition that becomes a hallmark of this production as the play's comic and dramatic elements feed into each other in a tight weave. 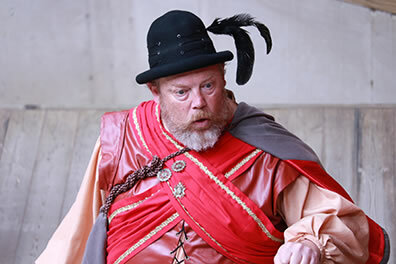 Blue Lake Public Radio prefers its Elizabethan theater plays to use Elizabethan costuming. Don't let that fact, the company's dedication to textual fealty, and the theater itself misdirect you into thinking we're attending "museum Shakespeare." This Much Ado About Nothing is one of the most modern renditions I've seen, thanks to the dexterity with which the cast handles the text. Kathleen Bode as Beatrice is a particular standout: she may be speaking 16th century verse, but she sounds like a new U.S. Congresswoman riffing on tradition-bound men and moldy society attitudes. Her comic timing is so fine-tuned and her line readings so off-handedly casual she induces extended laughter with each joke Shakespeare gives her, and some he might not have known he had written. "I see, lady, the gentleman is not in your books," says the Messenger in the opening scene. "No. An he were, I would burn my study," says Beatrice, and by combining a sardonic tone with a thoughtful pause in her delivery, Bode gets the production's jocular vein flowing even before Sytsma's Benedick shows up. Such repartee in absentia only heightens the chemistry that erupts when the two are on stage together, creating rich comedy plus genuine, though hesitant, romance after their characters are fooled into loving each other. Their acute comic performances do put the production's tragicomic weave to the test when Beatrice demands that Benedick "kill Claudio," a notoriously tricky moment for any production. The line gets an explosive laugh here, though Bode and Sytsma are not playing it that way. Then, as Beatrice moves through her rant, Bode roars, "O God, that I were a man! I would eat his heart in the market-place," and she gets another explosive laugh. Among the groundlings (where I'm standing for the play's second half), we can see the fierce passion in her performance, the tear-dripped mascara flying off her face, but the laughter comes from the gallery behind us. That could be a disconnect peculiar to the space, which suggests that the emotional underpinnings of Shakespeare's plays played as differently to the class-segregated audiences in his theater as did the play's intellectual layers. The thing is, the cast generally, but especially these two actors, play key nuances in their lines. When Hero (Ashley Normand) and Ursula (Sarah Stark) are laying their trap for the eavesdropping Beatrice, Bode's face takes on a disdainful aspect as Hero talks of Claudio (this is before he jilts her at the altar). Then her expression turns jealous as Ursula praises Benedick (this is before she's been gulled into loving him). Back when Don Pedro first broaches the gulling plot, Normand's Hero agrees to play along, telling the prince, "I will do any modest office, my lord, to help my cousin to a good husband," the emphasis questioning whether Benedick fits that job description. "And Benedick is not the unhopefullest husband that I know," Don Pedro says, responding directly to Hero's emphasis. Sytsma's Benedick is a fun-loving, avowed bachelor, and Beatrice clearly sticks in his craw, but he yet maintains an honorable foundation through the course of the play. He employs an incisively judicial tone as he questions whether Don Pedro intervened on Claudio to woo Hero for himself. Having subtly established this attitude in his portrayal, Sytsma gives himself the psychological room to believably play Benedick's transition in the "Kill Claudio" passage, from initially—and adamantly—refusing Beatrice to ultimately accepting her demand. Over the course of 30 lines of intense dialogue, she convinces him it's the just thing to do. Scritchfield, the stage manager for the original production and assuming the role of Claudio in this remount, adheres to the text as he delivers a believable and empathetic Claudio who is heroic yet naïve, accomplished yet undisciplined, gregarious yet immature. Scritchfield does depart from Claudio's racist remark at the end of the play when he says he will marry whomever Leonato orders, "were she an Ethiope." Scritchfield substitutes "Irishman." Well, at least it scans. 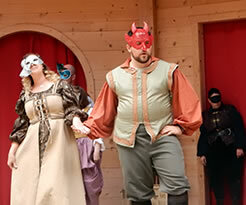 Left, at the masque, Beatrice (Kathleen Bode, left) dances with Benedick (Brad Sytsma) as Don John (Kat Hermes) watches in the background in Pigeon Creek Shakespeare Company's production of William Shakespeare's Much Ado About Nothing at the Rose in Michigan's Blue Lake Fine Arts Camp. Photo by Eric Minton. Below, Scott Wright as Dogberry. Photo by Riley VanEss. Huber also employs subtle blocking that further fleshes out the characters' personalities. As the aborted wedding begins, Don John stands next to his brother, Don Pedro, displacing Benedick from his accustomed place in the prince's party. This indicates how much Don Pedro and Claudio have bought into Don John's scheme, as the two brothers seem more brotherly than ever. As events unfold after Claudio accuses Hero of being a whore, Hermes' Don John positions himself to block Beatrice, and her seething demeanor seems ready to erupt into all-out attack mode. Interesting that they recognize Beatrice, not Leonato or Hero's Uncle Antonio or even Hero herself, as the force they might need to neutralize. Leonato (Scott Lange), in fact, tries to physically attack his daughter; this might seem extreme except that Normand portrays Hero, responding to Claudio's accusation, exhibiting the same fiery spirit as her father, without the physical violence (but her words have a sharp edge as she lets them fly forth). In another unique piece of stage business, the watch comes upon Conrad (Sarah Stark) and Borachio as if in complete darkness. This makes sense in the plot and feeds the physical comedy, especially as we're watching the play in the middle of the afternoon. Fremer plays Borachio as buffoonish from his initial appearance. When the Sexton (Normand in a clever piece of doubling) confirms the watch's report, Fremer's Borachio smirks with pride at each of the Sexton's announcements: that Don John has stolen away, that Hero was accused, that Hero was refused, and that Hero "upon the grief of this suddenly died"—the last chasing Borachio's smirk from his face. He thought he was just playing a game to amuse his master. For all the fine work of Bode, Sytsma, and the ensemble, the performance that sets this production in the upper echelons of Much Ados that I've seen—more so than the Rose theater even—is Scott Wright's Dogberry. Like Scriitchfield, he assumed the role for this remount, and in staying true to the company's creed to stay true to Shakespeare, his is the truest Dogberry I recall seeing because he plays the lines exactly as Shakespeare wrote them. He adds no extraneous attitudes, no excessive mannerisms, no contextual backstory. We get a well-meaning, earnestly duteous Dogberry who thinks of himself as highly learned delivering his malapropisms with intellectual certitude. This proves to be gut-busting funny, every one of his lines collecting laughs in the gallery and mosh pit. I'm fed up with the Dogberrys I've been seeing lately, frantically, antically channeling physical humor (sometimes at odds with the text) to make the character bigger than life. Dogberry is funny because he is life. Will Kemp surely originated the role, and he had a reputation (referenced by Shakespeare himself in his plays) for going off-script. Watching Wright earn the laughs he does merely by speaking Dogberry's lines demonstrates that either Kemp's ad libs made it into the Quarto and First Folio versions of Much Ado About Nothing or he saw the genius in Shakespeare's own comic capabilities. You can't make Dogberry any funnier than Wright makes him here in the Rose, a space Kemp would know how to work to maximum effect.